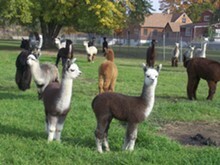 Alpacas may cause stress release & serious relaxation! Come join us in our lush, green pasture for a 1 hour yoga class with my herd of friendly and beautiful alpaca mommies and babies! Exercise your soul amongst the most curious and gentle of animals, alpacas! Our instructor comes to us from Chagrin Yoga, . After class, get "up close and personal!!"